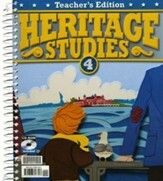 Give students a thorough understanding of American history with Heritage Studies 4 from BJU Press. Integrating civics, culture, economics, geography, and history into a comprehensive social studies course, Heritage Studies 4 looks at US history from the first Americans through WWII. Portraits and historic photographs are included throughout the student textbook for a visually appealing look into the past; comprehension and critical thinking questions are sprinkled throughout to help draw attention to important topics. Activities are also included. The teacher's guide includes reduced-size student pages that have the correct answers overlaid in 1/4 of the two-page spread. A page and a half are devoted to lesson notes, including objectives, specific teacher materials needed, how to introduce the lesson, preparation for reading, and the lesson itself. Semi-scripted lessons include questions to ask in blue; correct answers in pink; directions for what to explain, display, distribute, or other teacher actions are printed in black.The included Teacher's Toolkit CD has the activity manual answer key, background information, instructional aids, primary sources, materials list, rubrics, visuals, state cards, and interactive visuals. The student activity manual is designed to provide reinforcement of the ideas in the text throughBible connections, map skill practice, study skills, study guides, and chapter reviews. A variety of exercises are provided, including matching exercises, sentence-completion activities, comprehension questions, graphic organizers, and more. The student activity manual answer key features full-page, full-color reproductions of the student pages with the correct answers overlaid. Lesson and student page numbers are noted. The tests provide an easy opportunity for assessment; the test answer keyfeatures full size reproductions of the student tests with the correct answers overlaid. 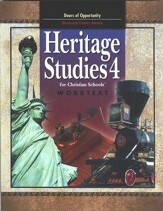 Heritage Studies 4 Teacher's Edition, 3rd Edition, 472 pages, spiralbound with soft frontcover and hard backcover. 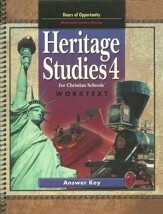 Heritage Studies 4 Activity Manual Answer Key, 3rd Edition, 225 pages, spiral-bound. Softcover. This "updated" kit is different in that it includes the Heritage Studies 4 Activity Manual Answer Key as a physical book, rather than a component on the Teacher's Edition CD-ROM. 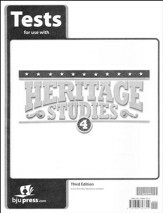 This resource is also known as the Bob Jones Heritage Studies 4, 3rd Edition Updated Edition Kit. Portraits and historic photographs are included throughout for a visually appealing look into the past; comprehension and critical thinking questions are sprinkled throughout to help draw attention to important topics. Activities are also included. 492 pages, softcover, 3rd Edition. 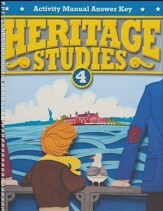 This resource is also known as Bob Jones Heritage Studies Grade 4 Student Text, 3rd Edition. This teacher's guide accompanies BJU Press' sold-separately Heritage Studies 4 Student Text (3rd Edition). Reduced-size student pages have the correct answers overlaid in 1/4 of the two-page spread. A page and a half are devoted to lesson notes, including objectives, specific teacher materials needed, how to introduce the lesson, preparation for reading, and the lesson itself. Semi-scripted lessons include questions to ask in blue; correct answers in pink; directions for what to explain, display, distribute, or other teacher actions are printed in black. The included Teacher's Toolkit CD has the activity manual answer key, background information, instructional aids, primary sources, materials list, rubrics, visuals, state cards, and interactive visuals. 472 pages, spiralbound with soft frontcover and hard backcover. 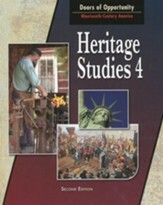 This resource is also known as Bob Jones Heritage Studies 4 Teacher's Guide, 3rd Edition. This student activity manual is part of the BJU Press Heritage Studies 4, 3rd Edition curriculum. Designed to provide reinforcement of the ideas in the text, these pages include Bible connections, map skill practice, study skills, study guides, and chapter reviews. A variety of exercises are provided, including matching exercises, sentence-completion activities, comprehension questions, graphic organizers, and more. 225 pages, consumable workbook. Grade 4. Three-hole-punched; pages are perforated for easy removal. This student activity manual answer key is designed to be used with the BJU Press' BJU Heritage Studies Grade 4 Student Activity Manual, 3rd Edition (not included and sold-separately). Full-page, full-color reproductions of the student pages have the correct answers overlaid. Lesson and student page numbers are noted. 225 pages, spiral-bound. Softcover. 3rd Edition. This resource is also known as Bob Jones Science Grade 4 Student Activity Manual Answer Key, 3rd Edition. These tests accompany BJU Press' Heritage Studies 4 Grade 4, 3rd Edition curriculum. They include only the tests; answers may be purchased separately in the Heritage Studies 4 Tests Answe r Key (3rd Edition) Tests are not reproducible. Glue binding for easy removal. Grade 4. 3rd Edition. 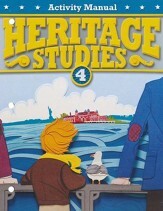 This resource is also known as Bob Jones Heritage Studies 4, Grade 4, 3rd Edition. 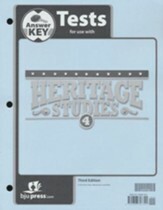 This test answer key accompanies the sold-separately Heritage Studies 4 Tests (3rd Edition) Full size reproductions of the student tests have the correct answers overlaid. Looseleaf and three-hole-punched. Grade 4. 3rd Edition. 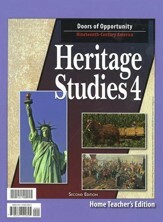 This resource is also known as Bob Jones Heritage Studies 4 Test Key, Grade 4, 4th Edition. 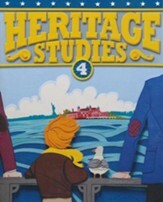 This Heritage Studies Listening CD accompanies BJU Press' Heritage Studies Curriculum, 2nd Edition, for Grades 1-6. Songs, narrations, and text excerpts are arranged by grade. Lesson numbers are notated in the linear notes. 46 tracks. 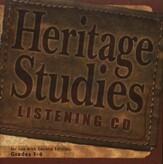 This resource is also known as Bob Jones Heritage Studies Listening Audio CD.